Recently, SiriusDecisions released a new version of its popular "demand waterfall" marketing effectiveness framework. Since 2002, many marketers have used the Sirius-defined processes, and the terminology "Marketing Qualified Lead" (MQL) and "Sales Qualified Lead" (SQL), to align sales and marketing activity and to track results. 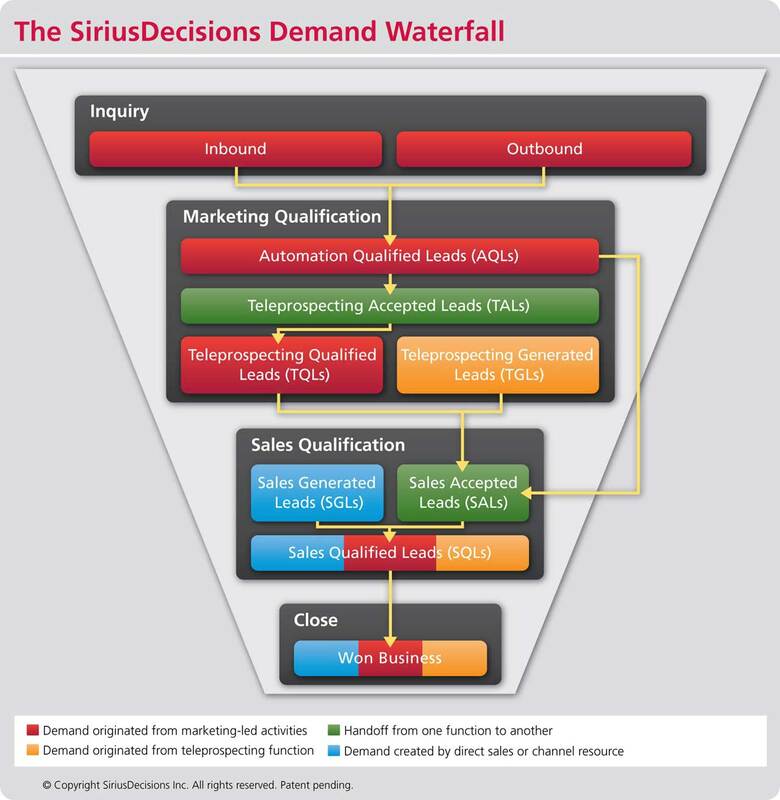 By all accounts, the new demand waterfall graphic and report were very well received, particularly among those who have adopted Sirius's terminology. So, what was once defined as a tidy "funnel" or a simple "waterfall" is no longer as relevant as it once was. Think, instead, a river fed by many brooks and streams that gracefully come together, only to rush over the edge of the waterfall into the (sometimes) beautiful and tranquil pond below at the last minute. Although this is no "A River Runs Through It" family drama starring Brad Pitt, the turbulent relationship between the Paul and Norman characters in the movie is not far off from the relationship between Sales and Marketing . The changes from Sirius explicitly address that relationship. The following are the four key changes that stood out for me. Adding inbound vs. outbound marketing channels. Although both techniques create Marketing leads to be scored, qualified, nurtured, and closed, the close rates from each activity should be measured independently to ensure investments are made appropriately. Adding teleprospecting teams. The original waterfall focused solely on Marketing leads to close business. Because Marketing sometimes has a teleprospecting team that qualifies leads before handing them to Sales, the waterfall needed to be updated. The new waterfall creates a unique process called "Teleprospecting Accepted Leads" and "Teleprospecting Qualified Leads." Adding teleprospecting as a source. Teleprospecting teams often generate their own opportunities from cold-calling or database-mining techniques. A new step called "Teleprospecting Generated Leads" was therefore added to the waterfall. Formally adding sales activity. Although sales-generated opportunities were assumed to be part of the overall funnel, they were previously not formally included in the demand waterfall. In many organizations, Sales is assigned goals based on how much business it can develop, and the marketing activity is almost an afterthought. Including sales efforts in the funnel explicitly shows a more complete picture. So, what do these changes mean to you? Use the following three key actions to put the changes into practice in your organization. Aaron Dun is senior vice-president of marketing at SnapApp, an interactive-content platform.